The Philosopher's Path (or Tetsugaku-no-Michi as it is known in Japan) is one of the greatest exploratory walks you can experience in Kyoto. The Path is located in the northern area of Higashiyama district at the base of Kyoto's East Mountain. The path follows the Lake Biwa Canal for around 29 kilometres along the base of the mountain. The trail is lined with cherry trees on either side. 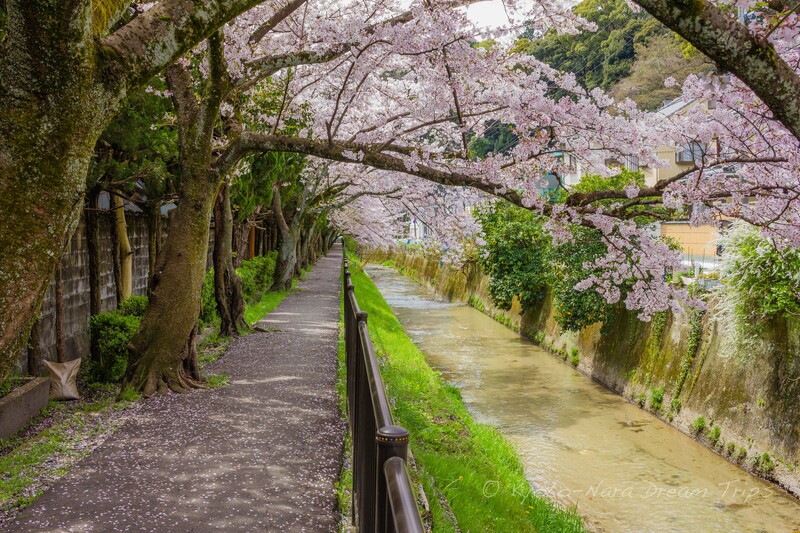 During the cherry blossom season, this is one of the most popular spots to come and view the spectacle. 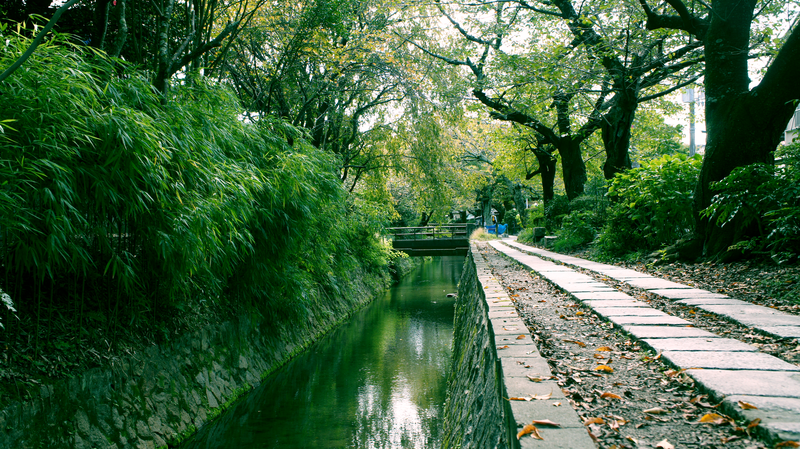 The canal was first to build during the Meiji period to power Japan's first power plant. With this power plant came the revitalization of the area due to electric modernization. The path is named after one of Japan's most famous philosophers, "Nishida Kitaro" . Nishida Kitaro would come to this area of Kyoto and walk along the river while he practised his meditations. He would do this every day on his walk to the University. Now, his practice is immortalised forever and hundreds of people still walk with him in spirit. The path is so far away from the centre of the city, and being so close the mountains, even the air is fresher up here. All the better for deep thinking and relaxation. Start your journey along the path either early in the evening or late at night. Tourists flock here throughout the day and the tranquil atmosphere is ruined with you have to fight your way down the sidewalk. 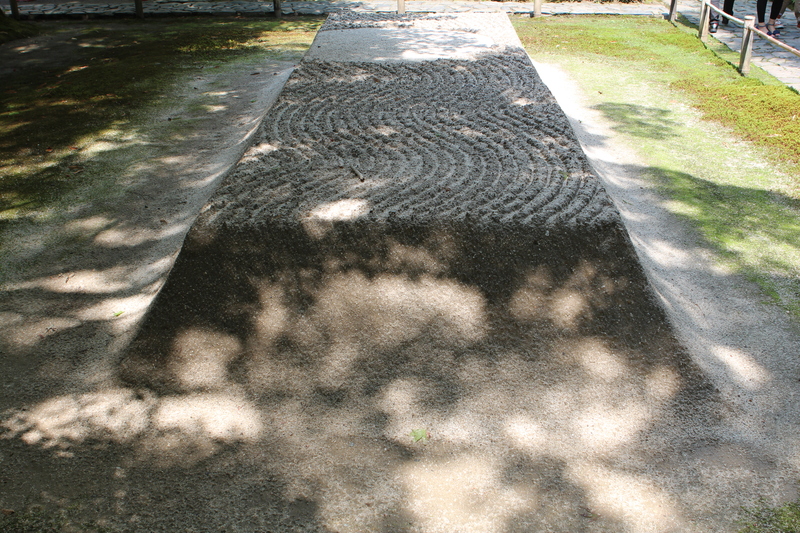 To start the Philosopher's Path, make your way to Ginkaku-ji Temple . Ginkaku-ji or the Silver Pavillion is known for it's incredibly preserved Higashiyama architecture and its calming zen garden. If you haven't visited this temple before, this is a great opportunity to do so. 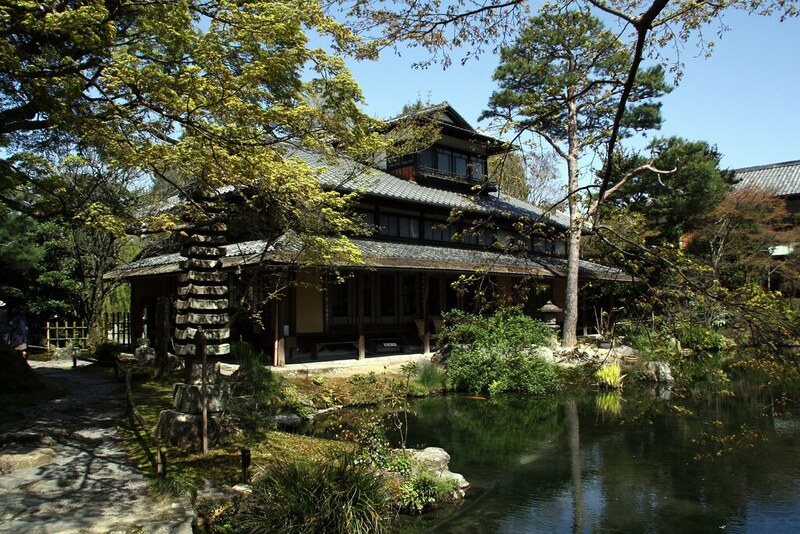 After visiting the temple, you might also consider seeing Hakusasonso Hashimoto Kansetsu Garden & Museum . Hashimoto Kansetsu was a famous Japanese painter who lived and worked in Kyoto during the Showa and Taisho eras. These days you can tour the former home, studio and alluring garden. Admission for adults is 1300 yen but worth it if you're into Japanese gardens and art. From here, head south down the sidewalk along the canal. Take your time as you walk to admire all the different plants along the route. You'll pass hydrangeas, narcissus, mugwort, bamboo, Japanese maple and if you're there in the Spring, lots of cherry blossoms. But plants aren't the only thing that pops up along the way. I saw all sorts of different animal life like ducks, turtles, bush warblers and a stunning grey heron. Humungous carp and koi also swim up and down the canal and often you'll see old men and young children sitting on benches beside the water, throwing bread into feed the fish. Dog walkers are pretty common here, so if you're a puppy lover, wandering this route will result in lots of opportunities to see local dogs off for a walk. Sagan is a small but quaint coffee and snack shop along the route with charming decor and a back patio, perfect for having a coffee early in the morning. Kisaki is another shop which sells fresh tofu! If you're a fan of this dish, there is no better place to try it! It's fresh and gives you the perfect punch of energy for continuing on the route. Honen-in Temple is the next stopping point on the trail. 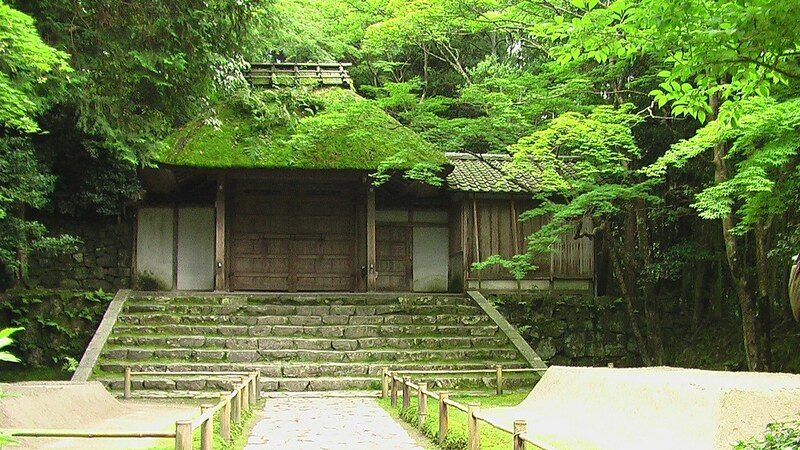 Here you'll admire the moss-covered gate before entering the temple. Honen-in was built in 1680 to honour Honen (1133-1212), the founder of the Jodo sect of Buddism. Honen-in Temple is especially known for their sand sculptures. Giant mounds of sand are created and flattened on top to allow artists to come to draw different patterns into the sand. 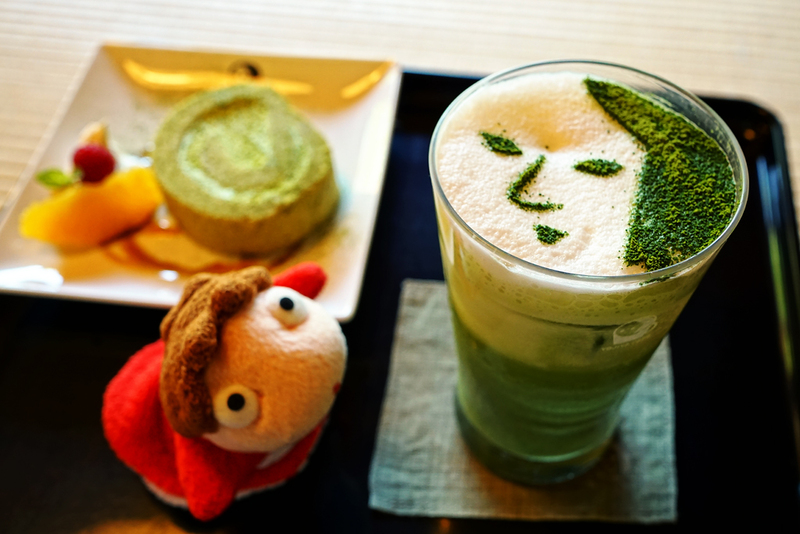 If you need something else to snack on or want to take a break along the way, another cafe worth checking out is Yojiya Cafe Ginkakuji . No cafe in the world might have a better view than this, and their matcha lattes are 100x better than anything you'd get at Starbucks or a vending machine. Along the way, don't be surprised if you see rocks or stones, etched with kanji characters sitting along the side of the path wrapped in fabrics. These are Jizo , protectors of travellers in Buddism. Local women take care of these Jizo, dressing them and keeping them warm. This is thought to endow these women to the gods for their life after death. The next temple worth visiting is Anraku-ji Temple . 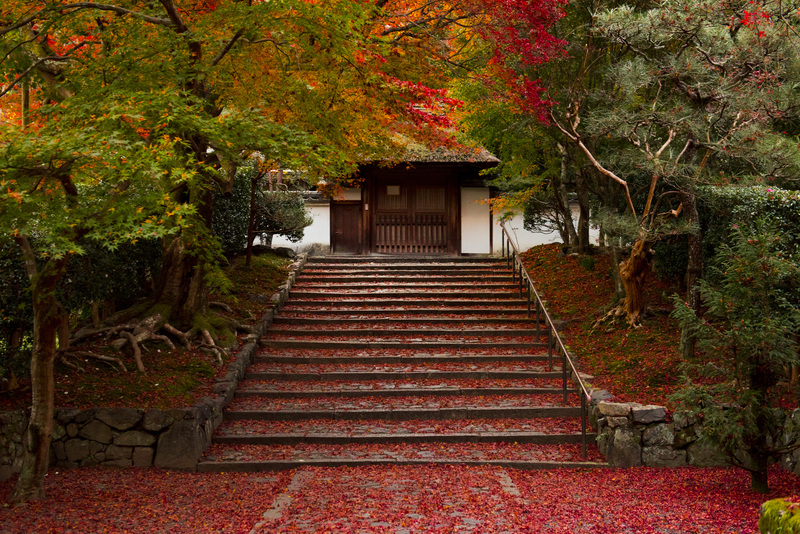 This temple is a hot spot during the fall for pictures of the maple trees as their bright red leaves fall on mass onto the steps of the temple. The Otoyo Shrine is a smaller shrine off the trail. Most shines are protected by lions, dogs or dragons. This shrine is protected by mice ! 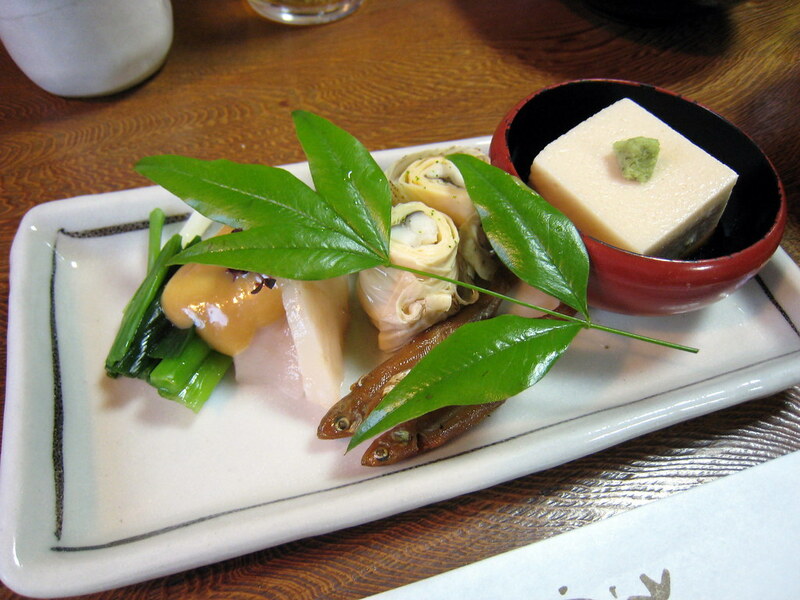 Otoyo Shrine is named after the deity Okuninushi-no-mikoto , the god of marriage. Although mice and marriage might not seem a likely combination, their presence comes from an old Japanese myth. It tales the tale of Okuninushi who met his princess in another world. The princess was put through many trials and almost perished in a fire, but a mouse appeared and told her of a hole in the ground where she could hide until the fire passed and the princess was saved so she could marry Okuninushi. Mice are also thought to bring health, long life and happiness. People who come to worship here are said to be blessed with the ability to have a healthy baby. If you don't feel like stopping at a cafe, there are other options for food or drinks along the trail. Like everywhere else in Japna, vending machines are everywhere and will provide warm or cool drinks along the path. There are also locals who set up small, honour system outdoor shops where you can grab something for your journey. Nanzen-ji Temple is one of the last temples along the route. It was built in 1291 for Emperor Kameyama on the site of his previous palace. The best thing to see here are the Hōjō gardens . 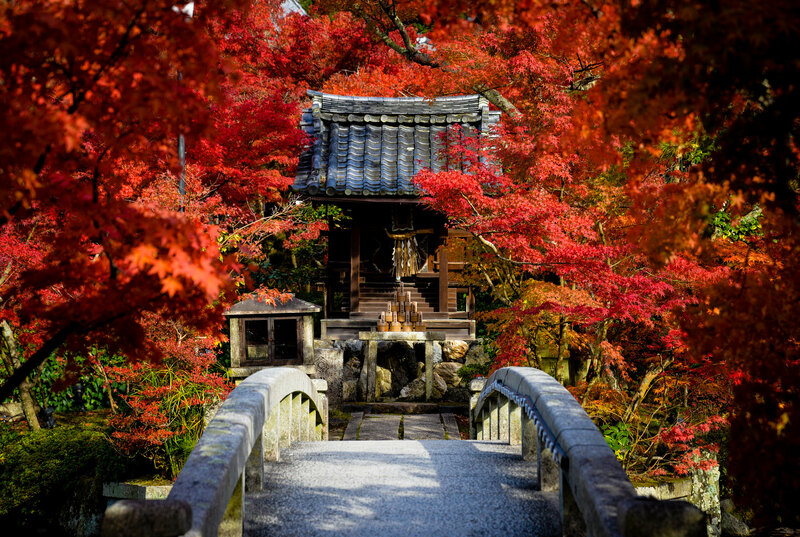 The Hōjō gardens are one of the best examples of "karesansui" gardens in Japan. They mirror the natural forms of their environment, and unlike many European gardens, they are 90 percent gravel. This might seem odd and ugly but the result is a marriage of the natural environment and the man-made arts. Inside the Hōjō you'll find Japanese screen painting with golden embellishments by Kanō Tan'yū which are considered a National Treasure in Japan. The last temple to see along the way is Eikan-dō Zenrin-ji . Eikan-do is one of the most scenic temples in Kyoto with a collection of Amida Buddas which have been painstakingly restored to their original state. The ground of the temple stretch out for acres, and you'll see stunning zen gardens, architecture from various periods of Japan's history and even an overlook at the top of the path with a spectacular view over Kyoto. This last temple concludes the walk through the Philosopher's Path. Don't feel the need to stop off at every stop. If something catches your eye, go exploring. If you'd prefer to just walk along the canal and meditate to the flow of the water, make that your experience. The trail offers so many options, so many places to explore. Take the time to make a pilgrimage here and discover when secrets you can uncover along the route.